Nobody likes thinking about sewage or having to ever deal with it. Yet, when your sewer lines are compromised and need to be repaired or replaced, it can be as though you walked into a nightmare. A cracked, aging, or burst sewage line can be one of those things that you absolutely dread. The mess that’s created during repair is enough to make anyone run inside and lock the door. Luckily, there is a more efficient method of sewer line repair: Trenchless pipe replacement. Here are a few key advantages of going trenchless. Sewer lines are often buried underneath your beautifully manicured landscaping. Which means, during traditional replacement, your backyard turns into a dig site. Not only is it a mess to clean up, but it can cost you thousands of dollars on top of the pipe repair to fix your landscaping. With trenchless sewer line repairs, only two small holes are dug at either end of the buried pipe, which can be filled in afterward without much effort. Traditional sewer repair can often take days to complete due to the amount of digging and equipment required to complete the project. Trenchless pipe repair can take much less time since there’s no extra work (digging) involved. Simple repairs take even less time, which means you can get back to normal much faster. It’s simple: less labor equals less money. Usually, you won’t pay as much for trenchless repairs as you would for traditional repairs. A traditional “dig-and-replace” sewer main process can cost an average of $7,000 to $25,000, whereas a trenchless replace can be much less. However, you may still have to pay for a sewer line inspection and any other associated costs. Due to the process of trenchless pipe repair or replacement, the quality of the materials used is often superior to those used in traditional processes. 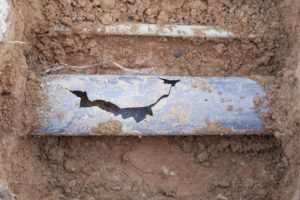 Cure-in-place liners for repairs and seamless polyethylene piping are typical materials used in trenchless procedures and aren’t as susceptible to damages caused by tree roots, rust, corrosion, or other typical piping problems. In the end, this means higher-quality results. Even though you might still need a sewer line inspection and will need to go through the process of hiring someone to come to your home, trenchless pipe repair can be the best way of getting the job done. If your sewer pipes have cracked, burst, or are aged beyond repair, give us a call today.